In an ideal world we'd never have to deal with these, but being a technical product, that idea is a mere, mere fantasy. If you do get one or more of these though, all hope is not lost! They can almost always be fixed with a little bit of magic...and/or code debugging. Some of the more common errors are listed below but you may also want to check out the full list of status codes on our Developer Site. This almost always means that there is something wrong with your API Key credentials. Make sure that they're written correctly and attached to your application. If it's the last one, then hosting on a different server would help if it was closer to the U.S. east coast, as that is where our servers are. This is our system's way of telling you that one or more concepts in your custom model are essentially "zombies" and not tied to any inputs. Once a concept is added to a model it must be used somewhere - else the system will complain about it. The good news about this one is that it will tell you exactly which concepts are zombied. At least it should be. If it's not for some reason then please let us know! Ah, that's a fun one isn't it? When our system is unable to determine what a specific error is, it'll give you this generic one that isn't a ton of help, admittedly. Any error codes that start with "99" are indicative of a possible server problem and should be reported to us. There are several things that can cause an account limit to be reached and this is one of the more common ones. Custom Model Concepts are actually counted across all model versions (not just your latest one) and thus deleted ones won't necessarily be subtracted from that, unless you delete the old model version that contained them. This can either be done with our User Interface or our API and the instructions are below! Resource does not exist. Model_id 'X' not found. Check the url of your request. No GDPR Consent. 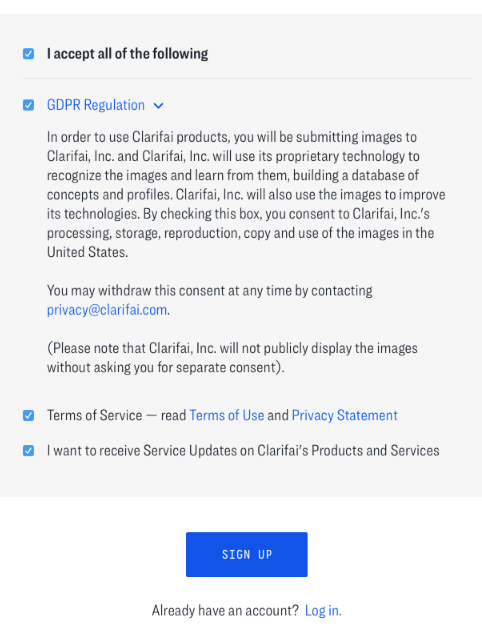 User doesn't have GDPR Consent. Simply put, this means that you haven't consented to our GDPR regulations yet, which means that you'll need to log out, log back in and then click on the appropriate checkboxes that appear. If you don't see these checkboxes for whatever reason please let us know!